Every year Granada is blessed with the great student migration at the end of the summer. A tradition that has been a celebrated as part of ‘Granadino’ culture since the university established its first faculty here in 1531. However there is another migration of people to the city that have recently been victim to some controversial behaviour. The people I am referring to are our neighbours who watch over us from the hills above the city lights. THE CAVE DWELLERS! For those who have no idea what or whom it is I am speaking of I would like to introduce you to a cultural phenomenon that has been an important part of Granada’s eclectic cultural patchwork for over six hundred years. 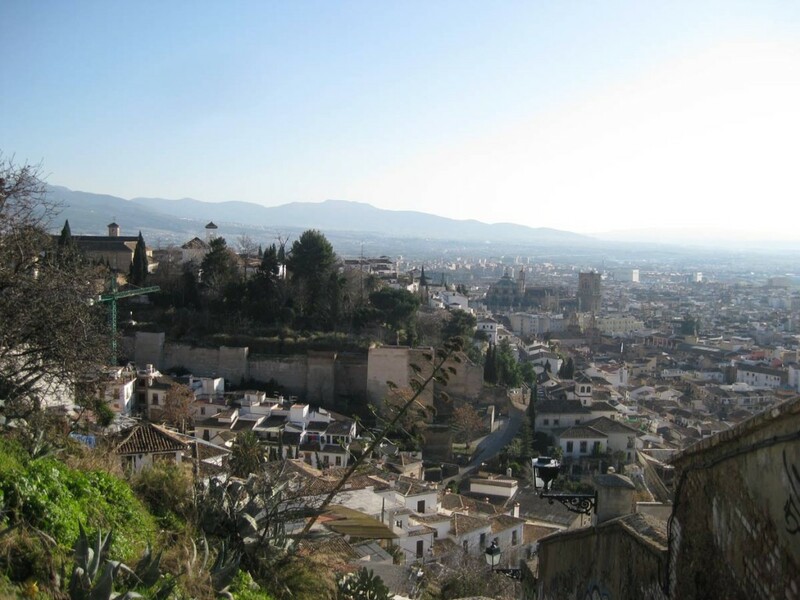 The Sacramonte and many of Granada’s other surrounding hills are home to approximately 2000 people residing in partially or fully renovated caves. Now when we think of people living in caves we would often envision Neanderthals and prehistoric civilisations huddled round a fire in a damp dark hole. However this could not be further from the truth as here in the greater Granada province we boast the largest collection of habitable caves in Europe. The people that you will meet, if you should take a wander off the beaten track and explore the caves (above the general touristy flamenco and holiday caves) will be, in most instances some of the most interesting, hospitable and enlightened souls in Granada. “There are a lot of caves up there” he tells me “ If we had been warned that someone had sinister designs for our cave we could have easily moved, We are transient people, ! There was no communication! None! The violence and aggression shown in this act of objective vandalism is really unfounded, especially in a place that is usually so peaceful and tranquil.” Sunya told me that he was actually there to witness the fire when it was initially started he said “ I saw smoke, I ran down to see what was happening and the two caves were on fire! I asked two carpenters who were working near by to phone the fire brigade and police, they took a while to get there as it is rather inaccessible, I was really scared the whole hill would catch fire! Cal then told me that both him and Sunya had seen a well known local business man (who denies any involvement or wrong doing), clearing the caves that were burnt and blocking them up just a week after the fire. ” Why do all that work if not for some sort of personal gain?” Cal asks. Sunya has also expressed some of his other concerns that may cause some serious complications, for not just him but for many the cave dwellers of the Sacromonte. “The old font beside the government building at the very peak of the Sacromonte has been shut off! This affects not only the inhabitants of the caves, but the walkers and tourists that climb the hill every day to see one of the most scenic views of Granada. Although a lot of the caves do now have plumbing some are still without such basic amenities. It is a process that must be carefully carried out as I’m told water can be “ The death of a cave”. Electricity is another luxury that some of the cave inhabitants do without but more and more caves are utilising ecological energy sources such as solar and wind generated power. I took a trip south to the rolling hills and beautiful bay of ‘Cala San Pedro’ on the ‘Cabo De Gata’ – Nature reserve, to find out more. Here I found that many more cave dwelling peoples were also using alternative power sources and even the bay’s only bar/restaurant is powered by two small windmills. After having spent some time with Sunya at his beautifully decorated cave I can clearly see how one could be so content with cave life in Granada. To wake up every morning and gaze upon one of the most spectacular views you could possibly imagine would make anyone smile as much as Sunya does. I can say that from the San Nicolas look out point you do get a wonderful view. However, from most of the higher caves you can capture an even more astounding panoramic view of the distant Sierra Nevada. 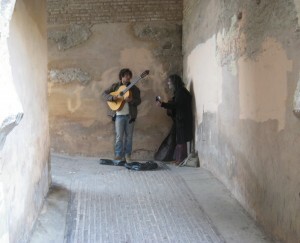 When the sun is rolling down over the city, with the Alhambra below you, it really is magical. Its breath taking grandeur gives you the feeling that whole world is right there in front of your eyes. Since The tragic events at Cal’s cave a couple of weeks ago, he and Blue have relocated to a new cave just outside the city where he promises me that the pickling will continue, Sunya continues to work on his already incredible cave, he even tells me there will be another room dug out very soon.